Surreal and quite aggressive images made in a large comic style, often carrying a strong political or moral statement. These are the words that could be used to describe the striking work of the mysterious Italian street artist, simply named – Blu. And, even though his pseudonym and artwork may appear simple enough, mind you, there’s a lot to be experienced and discovered beyond the surface of those three letters. The innovative and captivating animations of his work are mesmerizing to watch as his characters and artwork come to life on the walls of the cities. Walking through the streets of Berlin, one cannot but feel stunned when encountered with some of the magnificent works by the Italian artist. It takes some time to fathom and grasp the immense scale and the intricate technique in Blu’s art, the sheer size of his murals is usually majestic, and the “in your face” approach leaves no viewer indifferent. The artist himself invests all of his being into the creative process, and his social commentary is always at the forefront of the artwork. So much so that even by destroying or removing his work, the artist successfully creates a powerful message with an echoing impact. So, who exactly is this guy? Blu comes from Bologna in Italy. He still lives in his homeland, but his work took him on a journey all over the world as he left his “indelible” mark on the streets of the cities around the globe. He started writing graffiti more than 10 years ago, and over time, he came to learn that even though there is a lot of great quality and original ideas in the scene, a huge amount of people are in it just because it’s “cool”, and Blu has proven on numerous occasions, his work goes well beyond such games. As for many of his peers, at first, all of the work he had done was illegal, involving him going out during the night, trying not be caught, or painting on abandoned buildings. However, recently more and more permissions and commissions have been coming his way, allowing him to work in an official way, without the fear and pressure of doing something illegal. By selling some drawings and doing only personally-chosen commissioned projects, Blu manages to make a living by doing what he loves to do. He stated once that he tries to avoid other kinds of work such as commissions from companies and advertising, and even though he may not be economically rich, he’s a billionaire in happiness. Blu Removed some of his most Iconic Murals? Blu’s artwork is his reflection and expression of the feelings and thoughts he cannot say with words. And if a picture is worth a thousand words, then Blu is a prolific novelist. 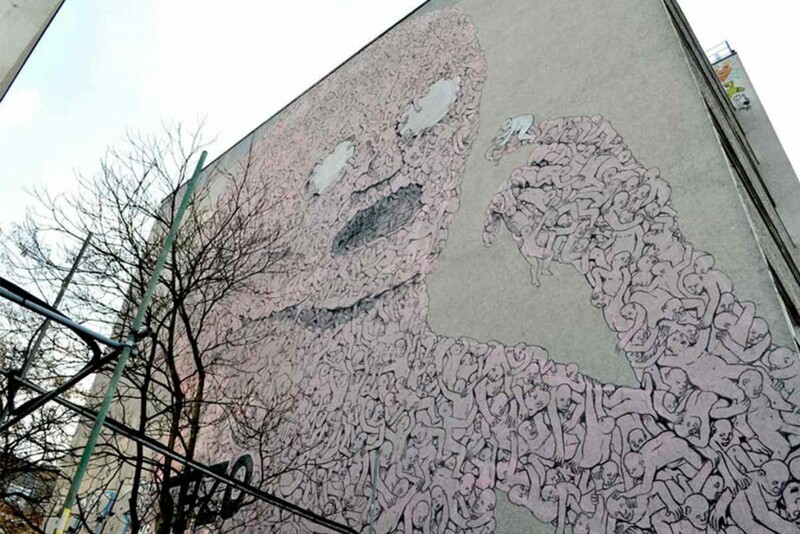 His contribution to the vivid street art scene of Berlin has been referred to as Berlin’s most iconic street art. 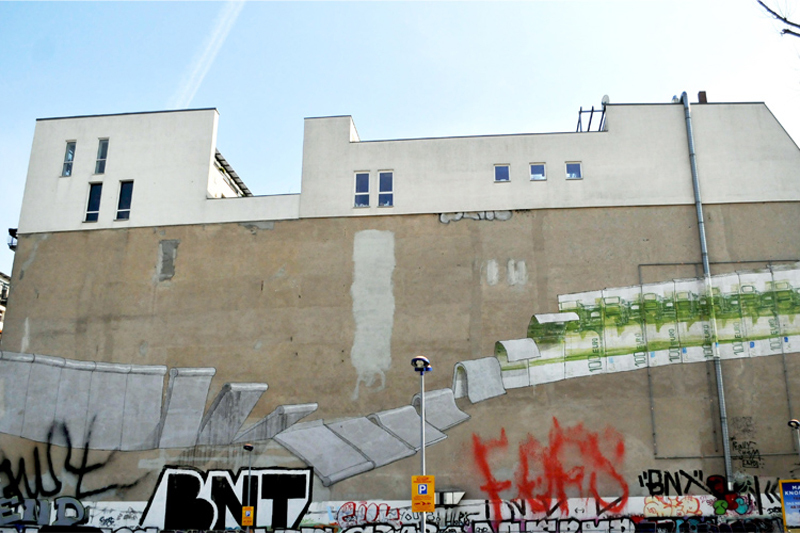 Kreuzberg neighborhood has become a major landmark in every street art tour in the city, and one of the main reasons was the embellishment of the huge side walls, created by none other than Blu. His signature epic-scale murals depicted a businessman chained by his golden watches; and the other piece, made in collaboration with JR, featured two figures unmasking each other, while holding up “east” and “west” side gang signs. It didn’t take long for the amazing artworks to gain worldwide attention and get interpreted as visual representations of the Berlin’s unspoken promises and nature. Created in 2008, seven years later, the majestic pieces were removed, reportedly by the artist himself. Perceived by some as an act of egotistical self-sabotage, or even as an attempt to fight development and change, the fact is that during the process of painting the walls black, a hand was temporarily left intact with its middle finger up. Perhaps this was all that’s needed to interpret Blu’s decision to paint over these iconic street art pieces. Even the removal of his artwork carried an underlined commentary on economic and social justice, criticizing the process of gentrification. However, these two Blu pieces were not the only ones which were removed. Another amazing artwork, entitled Global Warming (Hourglass) was a remarkable piece depicting an hourglass with melting ice in the top and a city in the bottom part. When the mural was painted over for a Hollywood movie advertisement, there wasn’t much fuss about it, even though an amazing piece of art was replaced with a movie industry advertisement. 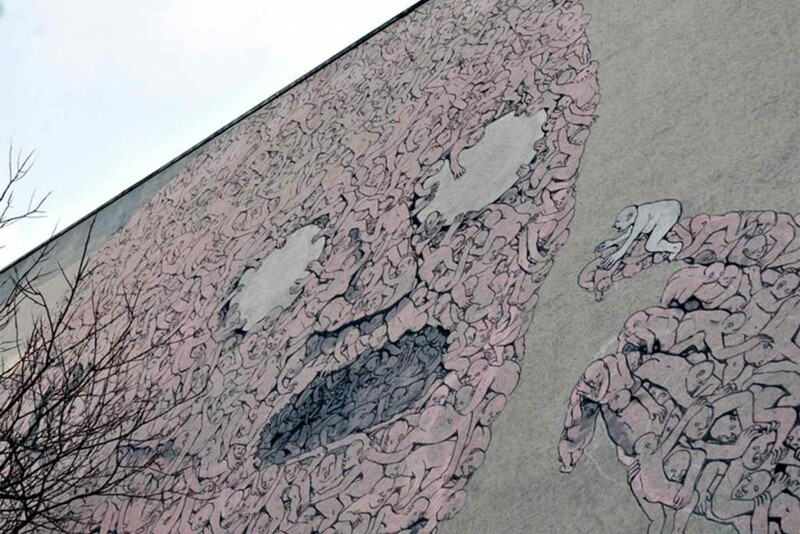 But, let us focus our attention now on the other astonishing pieces by Blu which are still existent in Berlin. Created back in 2007, a piece named Backjump is an intricate piece of work depicting hundreds of interconnected human bodies, all forming a giant figure which seems to be examining, or even getting ready to eat one of the miniature humans. The eyes with no pupils also perhaps indicate to the artist’s critique of our society’s blindness and lack of self-awareness. Another piece worth a gaze, and which will provide some food for your thought, is definitely the Wall painted by Blu in 2010. When viewed from left to right, the artwork shows the gradual fall of a wall, which then becomes a row of Euro bills. The Berlin wall collapses, the euro rises. 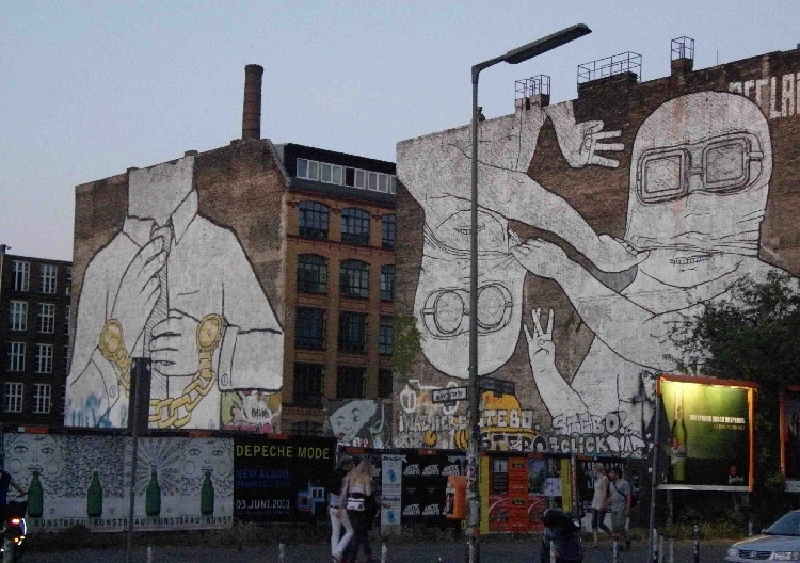 Even though the streets of Berlin have been a tumultuous ground for Blu’s art, we certainly hope the artist has not given up on his never-ending quest to fight gentrification, social injustice and the global capitalism. We eagerly await and hope to see more of the Italian artist’s unique vision and social commentary embedded in his astonishing art style.